A trip with Steam Dreams is made for sharing and we are delighted to offer a 10% discount for groups of 10 passengers or more. Whatever the occasion we can provide everything you need for a fabulous day out. From our fresh seasonal dishes to well thought out itineraries with interesting destinations, travelling with Steam Dreams will be a day to remember. Whether you are celebrating a special occasion, holding a corporate day out, Christmas party with a difference or purely spending time enjoying this unique experience with special friends and loved ones, we can tailor the day to fit your needs. To make your day more special we can order mementos or even customise a headboard for you. 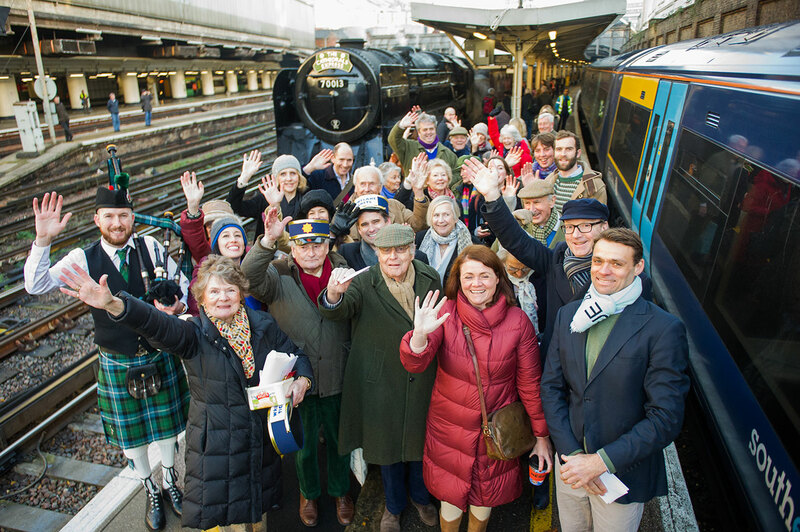 The Cathedrals Express can offer group packages on any of the trains in our current timetable, subject to availability. Special prices are also offered for complete carriages for all classes. A complete carriage can be booked for 42 people in Pullman Style, 48 in Premier Dining, 31, 42 or 48 in First Class and 64 in Premium Standard. First Class carriages can be either open plan or enclosed compartments which accomodate 6 people and a table for drinks and snacks. Carriages can be themed to suit the occasion, with special menus in Pullman Style and Premier Dining. In First Class or Premium Standard Class, canapés or sandwiches may be organized. Trains can also be hired for exclusive use. Please call the Booking Office on 01483 209888 for further information.